Looking back, I think my love affair with mornings coincided with the arrival of my first baby. Mornings suddenly became golden. My husband, being the stand up guy that he is, always took the first feeding of the night. (And yes, typically there were only 2 feedings a night…a bonus of having 9# babies!) I then, took the early morning shift, as I did not have a job I needed to rush off to in the morning. I remember rocking each of my babies (3 born within 28 months) in the dim glow of dawn, thinking how lucky I was to be a mom. I just sat, and rocked, letting my mind wander aimlessly. I would even prolong bringing them back to their cribs, as I was so enthralled with studying their facial features, and cuddling them in my arms. In these moments, the rest of the world ceased to exist. I actually mourned the end of early morning feedings. Then as my babies turned into toddlers, I treasured morning time in a totally different manner. Before they woke up, I savored my alone time. It was quiet and peaceful in the house. Life with a 1, 2 and 3 year old was hectic at times. But in the morning, I had time to single task. And, if I were lucky, I would be able to settle in with a cup of coffee and watch a little GMA, celebrating some quality “alone time” before the pitter patter of tiny feet crept down the hallway. Now my children are all college age, and most of the time, I have the whole house to myself. During the school year, I treasure the mornings when I awake well before the crack of dawn to go out for a run before my school day begins. I have time to gather my thoughts and plan my day. In the summertime, I savor the mornings when I awake without the aid of an alarm, and the world is still quiet and peaceful. I take time to reflect and write. I have even loosened up my fitness schedule to bask in the solitude of the day before the craziness of life begins. And each morning I look forward to this special cup of tea. Recipe created by Kathy Patalsky of Healthy.Happy.Life. and a little something sweet…I used raw honey or maple syrup. Wah lah! Here you have it…Lemon Goji Berry Tea! Very addictive! And the piece de resistance? 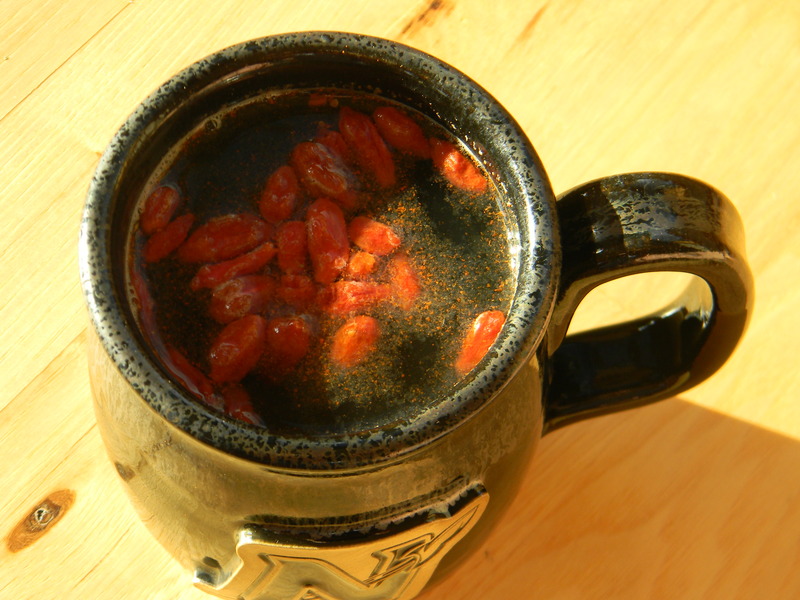 The plump little goji berries left at the bottom of my cup! To die for! I so appreciate mornings! How about you? Are you a morning person?